Registration for this program is now closed and scholarship recipients have been selected. Please see our program participants here! 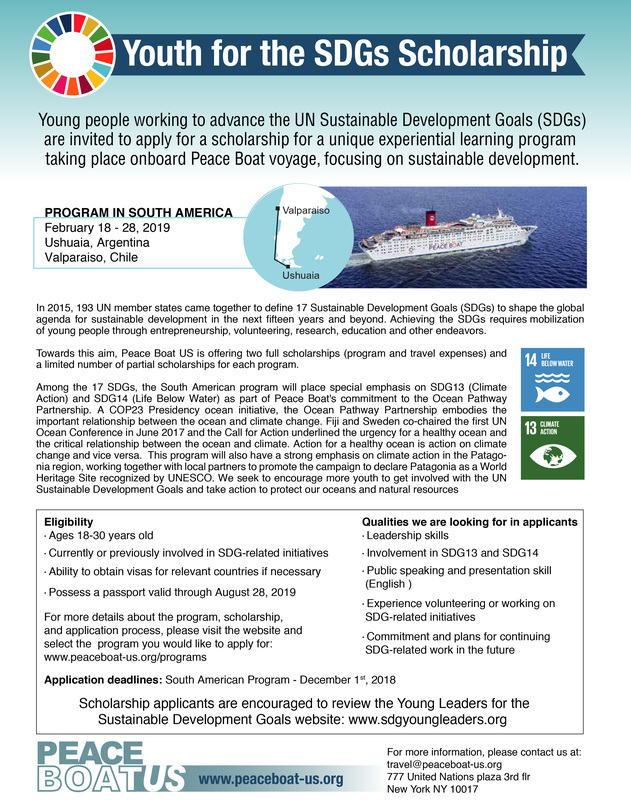 Travel around the tip of South America with the Peace Boat and learn about the UN SDGs in an experiential study program “Peace Education and the SDGs in South America,” taking place February 18-28, 2019 during Peace Boat’s 100th Voyage, sailing from Ushuaia, Argentina to Valparaiso, Chile. Achieving the SDGs requires mobilization of young people through entrepreneurship, volunteering, research, education and other endeavors. Toward this aim, Peace Boat US is providing two full scholarships (program fee and travel expenses) and a limited number of partial scholarships under the “Youth for the SDGs” theme. Please see below for application criteria and qualities we are looking for in applicants. Upon initial registration, we will send further details about completing the voyage registration, documents for submission, and payment processes. Short-listed scholarship applicants will be contacted individually to schedule an interview. Deposit and balance payment deadlines and processes will be confirmed soon.